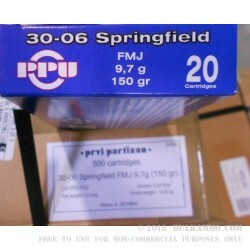 An almost hard to believe price point on proven reliable, accurate ammunition by the Serbian maker Prvi Partizan for the .30-06 Springfield. 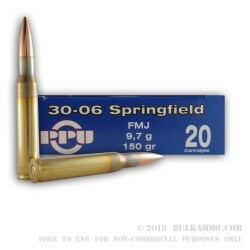 This is a very capable and versatile rifle cartridge that can be used for everything from target shooting to hunting of game from deer to bear. With the pricing that PP has on this 400 round case lot, this is a very reasonable entry point for many hunters, target shooters or plinkers who want to run a large amount of rounds through their trusty ‘ought six. The reliability and history of the Serbian production facility is in the top tier of European producers; with Prvi Partizan having been in existence since 1928 (almost as long as Federal Ammunition). 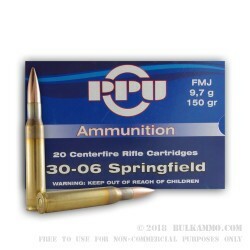 The last ten years have firmly cemented PP as a mainstream producer of ammunition for sale in the US shooting market and shooters realize that you don’t have to compromise on quality if you want to shoot quantity. 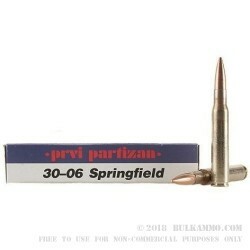 These rounds are a perfect reflection on that concept – one that Prvi Partizan has executed very well. 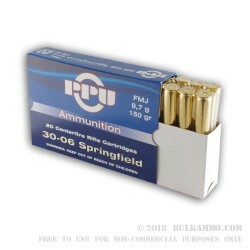 The 150 grain full metal jacket projectile is loaded in a brass casing that can be reloaded thanks to a Boxer primer and the nicely made brass. The accuracy should be better than 1.5MOA out of most rifles capable of shooting it.